Josh Marshall's fascination with photography began early in life, recognizing the power in capturing a moment in time on film with his pinhole camera. Catching that perfect moment filled with drama, history, romance, and intimacy is the ultimate success. Studying professional photography with Joseph Mahoney and Martin Wyand in beautiful Maui increased Josh's passion in helping people feel at ease in front of the camera. More recently, studying with Kevin Kubota in Italy has given him an edge and fresh outlook on his art and the latest techniques in photo editing. Our expertise focuses on working with families, high school seniors, newlyweds and newborns, framing the essence of new beginnings. 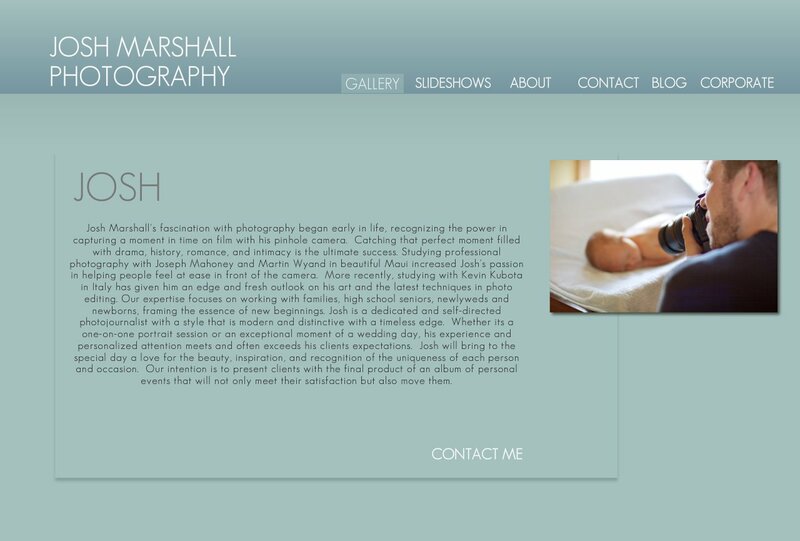 Josh is a dedicated and self-directed photojournalist with a style that is modern and distinctive with a timeless edge. Whether its a one-on-one portrait session or an exceptional moment of a wedding day, his experience and personalized attention meets and often exceeds his clients expectations. Josh will bring to the special day a love for the beauty, inspiration, and recognition of the uniqueness of each person and occasion. Our intention is to present clients with the final product of an album of personal events that will not only meet their satisfaction but also move them.